Walter Plate’s ascent in the early Post War movement was remarkable. One of the youngest artists of the Abstract Expressionist movement to achieve major exhibition status along side Guston, Gottlieb, Rothko and other modernist masters, Walter Plate’s works were eagerly purchased by the Whitney Museum of American Art, The Corcoran Gallery of Art, the National Gallery and other museums early in his career. Born in Woodhaven New York in 1925, he studied at the Grand Central School of Art in New York before enlisting in the Marines in 1943. Following the war he attended L’Ecole des Beaux Arts, La Grande Chaumiere and the atelier of Fernand Leger. In 1950 he came to Woodstock, New York and attended classes of Yasuo Kuniyoshi at the Art Students league. His early one-man shows are those of Ganso Gallery, New York City, 1954 and the Stable Gallery, 1958 and 1960, where Plate’s works were presented at the annual “Salon” of the most advanced and vital members of the New York avant-garde. His early group shows were global, including The Whitney Museum annuals, 1957-61, PAFA, 1955, 1960; the 26th, and 27th Carnegie International biennial exhibitions, The Tate Gallery, London, 1959; The International Exhibition of Abstract Artists, Tokyo, Japan, 1959; the Corcoran Gallery Biennials, Washington D.C. He was not a prolific artist, but when he painted, he received great reviews from the likes of Stuart Preston and Dore Ashton of the New York Times, and Lawrence Campbell of Art News. Yet, longer term, Plate’s conviction to stay out of the New York City mainstream and avoid publicity would take its toll. He never waivered in his commitment to abstraction, a position that rendered him a “figure from the past” during the last 12 years of his life from 1960-72. 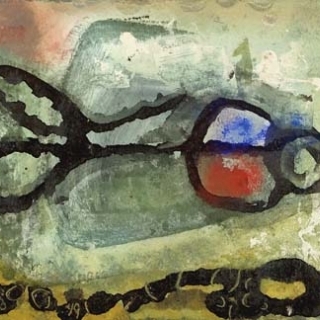 His painting career abruptly ended with his death at age 46 in 1972. Rarely, do Plate’s works come to market, being even scarcer than other short lived modern masters like David Park.